Featured in the first position on the Home Page. 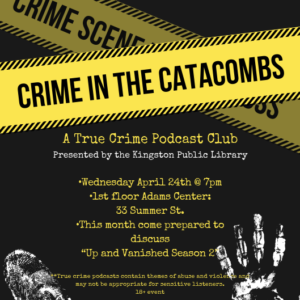 Join us on April 24th at 7pm for our second monthly meeting of Crime in the Catacombs: A True Crime Podcast Club. This month we’ll be discussing the podcast “Up and Vanished” Season 2 as well as picking our topic for May. The podcast can be found for free on various apps including Apple Podcasts, Stitcher, and Spotify. 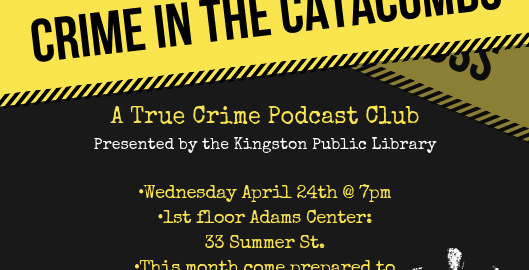 Our monthly meetings will take place at the Adams Center located at 33 Summer Street in Kingston. For more information contact the library at 781-585-0517. The podcasts for this group often contain mature themes and may not be appropriate for sensitive listeners. This event is for ages 18 and up and registration is not required.